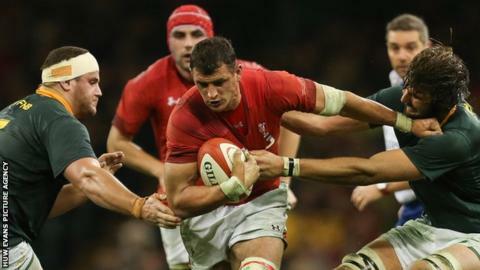 Wales back-row Aaron Shingler has signed a new contract with Scarlets. The 30-year-old was out of contract at the end of the season but follows fly-half Rhys Patchell in committing to staying at Parc y Scarlets. It is a welcome boost for the Welsh region, who will see John Barclay, Tadhg Beirne, Scott Williams and Aled Davies depart next year. "I'm very happy to have signed a long-term deal with the Scarlets," Shingler said. "I'm in my 10th season at the region and really enjoy playing my rugby here. "Winning the league [Pro12] with this group of people was a special moment last season but we want to continue to build and develop which will lead to us hopefully winning more silverware." Shingler has won 13 caps for Wales and started against Australia, New Zealand and South Africa during November's autumn Test series. He was recalled for the 2017 summer tour to play Tonga and Samoa three years after his last appearance, on the 2014 summer tour against South Africa. Scarlets have not released details on the length of Shingler's deal.